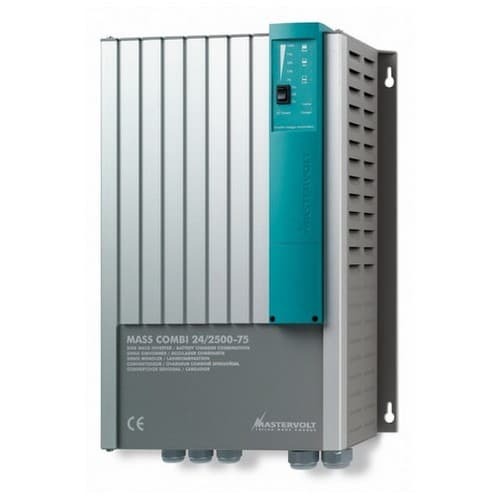 The Mass Combi inverter and battery charger in one is increasingly playing a leading role in carefully designed electrical systems. Mastervolt has integrated the most advanced technology into a compact package allowing owners to get the most value for their money. This offers you high-quality basic support for smaller systems without requiring a great deal of space. You will not have to worry anymore about the quality of shore power in any port - things will always work with the Mass Combi! The most vital functions in your electrical system now come within reach: battery charging supplying 120V power switching and the use of extended AC loads to be utilized on board even when limited shore power is available. Power can be drawn from a shore connection generator or charged batteries. Mastervolt's three-step Plus charging method guarantees more battery power and a longer life span. Batteries are always fully charged and fast even when a generator is used. And the clean power supply is perfectly reliable. Equipment including domestic appliances can now be safely connected to the on board network. Air-conditioning systems dishwashers and microwave ovens all function perfectly. Even if you are using the washing machine or other power hungry appliances the generator or batteries step in to temporarily bridge the gap. All this because of the tailor-made technology: the power to be independent!